With the decline in Facebook organic reach and some of the initial tests that we see Facebook pushing out, we must rethink the way we, as marketers, utilize the platform along with social media in general. Some companies are on social media mainly because their competitors are and maybe secondarily to push traffic back to the site to help drive revenue. But what happens when you start to see social referral traffic dwindle as your organic reach declines? This is Facebook telling you to either get users to pay to read your content or to refocus your social strategy to concentrate more on branding and engagement. Now before we get into why branding and engagement should be the focus of your strategy, let’s talk about the decline in organic reach and engagement that we’ve noticed throughout the past couple of years. 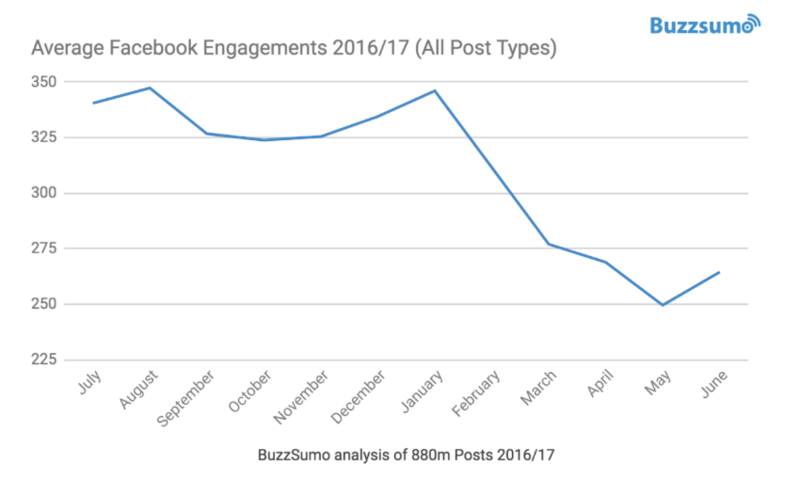 In August, BuzzSumo published a study that showed that engagement on Facebook posts has declined by over 20% since January 2017. You may be thinking, so what? Organic reach has been a struggle that most social media managers face on a reoccurring basis. Facebook’s recent updates to its News Feed have only made getting in front of users organically more challenging. Most notably, increasing the importance of individual relevance, helping rank authentic content, and most recently, penalizing links to non-mobile optimized pages. These recent updates, along with the increased competition coming from other brands and personal updates, users are faced with what Mark Schaefer calls Content Shock. This is the idea that there is more content out there than we can consume. Depending on your resources you may be able to post multiple times a day and see decent results…or you could cut that number in half and focus on sharing the best content. Now if you’re able to maintain a high level of quality content while increasing the cadence, please do, but if you’re struggling and have more than 6 posts going out a day on Facebook, this is for you. Another reason why we see a decline in organic reach on Facebook is due to the growth in popularity of social messaging apps (FB Messenger, WhatsApp, etc.). 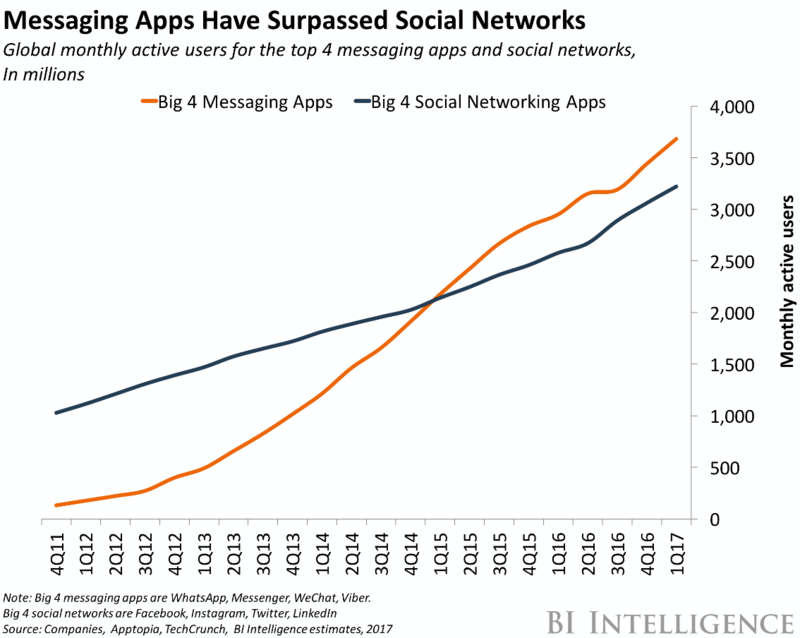 In a study done by BI Intelligence, we see that the Big 4 Messaging Apps surpasses the Big 4 Social Networking Apps in monthly active users. With more users opting to be primarily on a messaging app, we’ll only see the competition for impressions and reach increase on social channels. As organic reach continues to decline, what can you as a marketer really do, without having to pay to play? Tailor the content specifically to the social platform, with the user in mind. By customizing the article headline and finding the right content to share, you will increase the organic reach by making it easier for users to find the right content for them. Social Media has Become an Engagement Channel. Algorithm prioritizes engagement. That should be enough. If the algorithm sees huge positive interactions on a specific post, it will boost that content because more and more users are finding it relevant. Similarly, if there are more negative signals coming from a certain post the algorithm will lower the potential reach for that post. Most users use social media to reach brands to discuss an issue, find out shipping status, or rave or rant about the brand. Keeping an active channel and being able to interact with users can help win them over and turn a negative experience into a positive one. You may be thinking why should I use social at all then if I can’t drive traffic back to my website? Well, you should utilize social from a branding standpoint alone, as developing brand equity with users can help increase your overall revenue. Users usually will not convert the first time they visit a site or see a product, but staying top of mind by having an active social presence and maintaining your ability to interact with them can be the key to getting that sale. Additionally, consumers that engage with brands are more likely to purchase and advocate for that brand, whether that interaction happens on a 1-1 channel (messaging apps) or through a comment on a post, tweet, etc. Continually working to grow your online community and focusing on engagement will become key in the coming months as we continue to see organic reach dwindle. As the fight for user’s attention will grow, ensuring that users engage and continue coming back will be more important than driving that traffic to the site. If you need help refining your social media strategy or anything else digital marketing, contact Anvil!